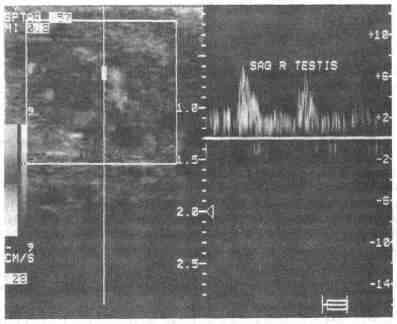 Bartsch G., Frank S., Marberger H., Mikuz G. Testicular torsion: Late results with special regard to fertility and endocrine function. J. Urol., 124: 375-378,1980. Bartsch G., Mikuz G., Ennemoser O., Janetschek G. Testicular torsion. In: Resnick M. I., Kursh E. D. (eds). Current Therapy in Genitourinary Surgery. St. Louis, Mosby, 1992, pp. 436-440. Cass A. S., Cass B. P., Veeraraghaven K. Immediate exploration of the unilateral acute scrotum in young male subjects.]. Urol., 124: 829-832, 1980. Dresner M. Torsed appendage diagnosis and management. Blue dot sign. Urology, 1: 63—66, 1973. Gislason Т., Noronha R. F. X., Gregory J. G. Acute epididymitis in boys: A 5-year retrospective study. J. Urol., 124: 533-534, 1980. Kass E. J., Stone К. Т., Cacciarelh A. A., Mitchell B. Do all children with an acute scrotum require exploration?]. Urol., 150: 667-669, 1993. Kogan S. J. Acute and Chronic Scrotal Swellings. In: Gillenwater J. Y., Grayhack J. Т., Howards S. S., Duckett J. W. (eds). Adult and Pediatric Urology, 2nd ed. St. Louis, Mosby, 1991, pp. 2189-2215. Skoglund R. W., McRobertsJ. W., Ragde H. Torsion of the testicular appendages: Presentation of 43 new cases and a collective review.]. Urol., 104: 598-600, 1970. Steinhardt G. F., Boyarsky S., Mackey R. Testicular torsion. Pitfalls of color Doppler sonography. J. Urol. 150: 461-462, 1993. Williams С. В., Litvak A. S., McRobertsJ. W. Epididymitis in infancy.]. Urol., 121: 125-126, 1979.